Almost everyone is dependent on using devices which use radio waves every single day. It’s surprising to find out just how reliant you are in your day to day life on this technology. Everything from your favorite smartphone, tablet, laptop, GPS to your best tabletop radio CD player uses radio waves. The electromagnetic energy carries the data using radio waves and is responsible for the creation of some truly innovative devices, which it is now hard to imagine living without. While we all use these devices daily without giving it much thought, few people understand how they work. Let’s take a look at how radio waves work. It’s easy to think that when you hear the word ‘radio,’ music and sounds come to mind. The truth is that radio waves aren’t sounds. They are the name of the medium used to broadcast an electronic signal. They get sent from a studio direct to your electronic device, and the speaker then turns it back into the vibrations which you can hear in the air. Radio waves are a type of electromagnetic radiation, like light or x-rays. Except they have longer wavelengths in the electromagnetic spectrum. The radio waves frequency ranges from as high as 300 GHz down to 3 kHz. At 300 GHz. 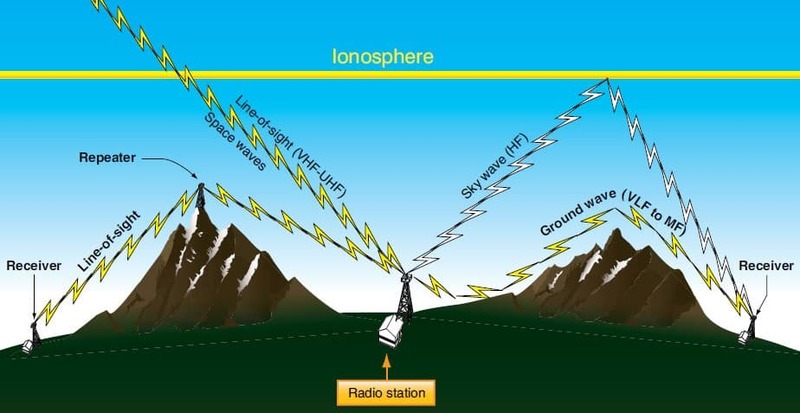 the radio waves wavelength is 0.039 in (1 mm), while at 3 kHz the radio waves wavelength is 62 mi (100 km). What is the speed and Size of radio waves? Radio waves travel at the speed of light, as do all electromagnetic waves. The speed of radio waves is 186,000 miles (300,000 kilometers) per second. The speed is much faster than the 1,125 feet (340 meters) which sound moves through the air. Radio waves are considered light. 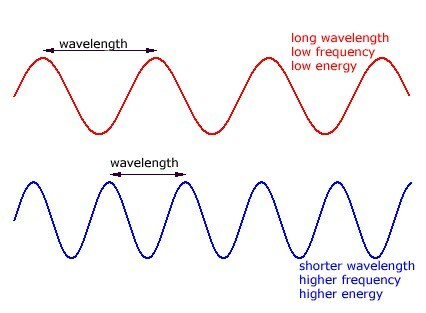 This is because they are waves with different frequencies and wavelengths of photons, and photons are light. All waves which are on the electromagnetic spectrum are considered light. They include gamma rays, x-rays, infrared, microwaves, and radio waves. How radio waves are produced? After a direct, oscillating electrical current is applied to a wire, it causes a current flow. This then builds an electromagnetic field around the wire. The electromagnetic field then sends an outward wave from the wire. After removing the current, then the field collapses and sends another wave. If a current is repeatedly applied and removed for some time, it causes a series of waves to spread at specific frequencies. Another way currents can make waves is by changing its polarity or direction continually. This forms the basis of electromagnetivity and is how radio waves are created within a transmitter. There are also radio waves that are generated naturally by either astronomical objects, nuclear reactions in a star or lightning. Yes, radio waves are a type of electromagnetic radiation. They use wavelengths in the electromagnetic spectrum. As radio waves are electromagnetic waves, they don’t need an elastic medium to travel as a sound wave does. Instead, they contain synchronized oscillations of magnetic and electric fields. Both fields oscillate perpendicular to each other, while the electromagnetic waves propagation is perpendicular to the oscillation direction of the electric and magnetic fields. Then while the magnetic and electric fields are oscillating, it transfers the energy of the wave. This means that radio waves don’t need a physical medium to travel in. There are also many other uses which range as far as remote-controlled toys. Can radio waves be polarized? Radio waves can be polarized, just like x-ray waves can. Conversely, sound waves are unable to be polarized. This is because radio waves and x-rays are transverse waves, and their oscillation is perpendicular to the direction of propagation. But, sound waves are longitudinal waves. The oscillation of their waves will always be in the direction of propagation. 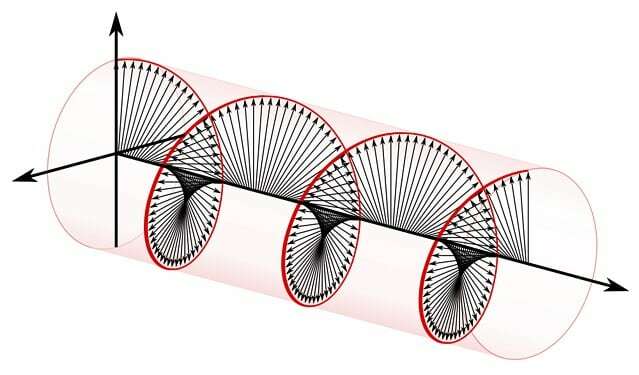 Polarized waves mean that you can filter the wave, and it’s possible to select only a part of the wave which oscillates in a specific direction. Non-polarized waves, however, will oscillate randomly in any direction. Can you see radio waves? All radio waves frequencies are at a much lower frequency than visible light. They also have much lower energy. Because of this, you can’t see radio waves directly. It is possible to take some invisible frequencies and make them directly visible. This is done by using them to make something else emit energy. The frequency which is emitted can then be seen by the human eye. Radio waves are not able to be seen directly, but you can see ultraviolet and infrared light. 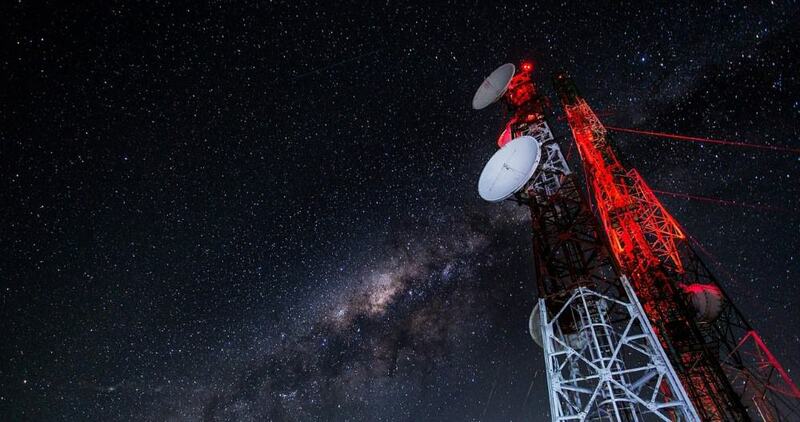 Can radio waves travel through space? Surprisingly, radio waves can travel through space. It allows astronauts to communicate with ground control using a radio unit. This is because radio waves are electromagnetic, not mechanical. Electromagnetic waves can transmit energy through a vacuum. What happens after the radio can receive a signal? It then converts it into sound. The sound will travel through the air inside a spacesuit without any problems. Can radio waves travel through water? Radio waves are able to penetrate water, but they do not travel well through electrical conductors. Salt water is highly conductive, and high in absorption. This causes it to limit high-frequency transmissions (short wavelengths) which are used by regular radio waves. But, low-frequency transmissions (long wavelengths) can travel through the water better. Those wavelengths are typically used to communicate with submarines underwater. At the same time, the depth and range are still great factors as they limit the efficiency of radio communication. Radio waves are a type of electromagnetic radiation which travels at the speed of light. They can be polarized and travel through space. But they can’t be seen by the human eye or effectively travel through water unless using low frequencies. NextAre Headphones Bad For You?